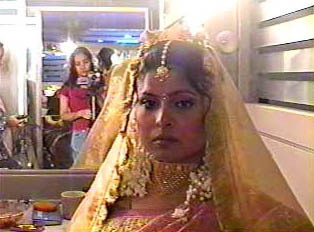 Generally, a wedding in Bangladesh is an event that easily lasts for ten days or more. For those who can afford it the first stage involves numerous days of shopping and preparation, a time when mothers and sisters purchase gowns, servants purchase food, and many gifts are bought by each family in preparation of the events and visits to come. The engagement ceremony is a part of the marriage cycle, whereby the groom’s family visits the bride at home and the mother-in-law to be puts the ring on the bride’s finger. Another engagement party follows a day or so later when the bride’s family visits the groom at his home. In both instances, gifts are brought by the visiting family to the host family. Following these, there is another celebration when the groom’s family visits the bride at home in order to put turmeric on her face and hands to enhance her beauty and prepare her for the wedding. A day or two after that, the bride’s family visits the groom and puts turmeric on his face. During each of these visits, there is feasting, singing and dancing, and it is traditional for the children of the host family to make up saucy and slightly irreverent songs about different members of the visiting family. The bride’s family pays for the wedding day which takes place several days before the actual reception. After the wedding, amidst many displays of grief, the bride and groom go to the groom’s home. After two days there, they return to the wife’s house for the wedding reception, which is paid for by the groom’s family. After spending a few days at the bride’s home, the newlyweds return to the groom’s house where ostensibly, they remain.